By asking “How did we get here?” Dana Goldstein brilliantly illuminates the path forward. The New York Times bestselling author Dana Goldstein gave a lecture at the College of Staten Island (CSI) discussing her book The Teacher Wars: A History of America’s Most Embattled Profession (Doubleday, September 2014). Hosted by the CSI School of Education, the lecture event drew more than 200 people from the campus and Staten Island community to learn more about her groundbreaking history of 175 years of American education, which the author feels may help find answers in the past to the controversies that plague public schools today. As an author, Goldstein writes about education, social science, inequality, criminal justice, women’s issues, cities, and public health, was invited by the CSI School of Education. She is a staff writer at The Marshall Project, and a contributor to Slate, The Atlantic, and other media outlets. The Teacher Wars upends the conversation about American education by bringing the lessons of history to bear on the dilemmas we confront today. Teaching is a wildly contentious profession in America, one attacked and admired in equal measure. 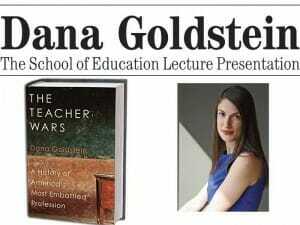 In The Teacher Wars, a rich, lively, and unprecedented history of public school teaching, Dana Goldstein reveals that teachers have been similarly embattled for nearly two centuries. From the genteel founding of the common schools movement in the nineteenth century to the violent inner-city teacher strikes of the 1960s and ’70s, from the dispatching of Northeastern women to frontier schoolhouses to the founding of Teach for America on the Princeton University campus in 1989, Goldstein shows that the same issues have continued to bedevil us: Who should teach? What should be taught? Who should be held accountable for how our children learn? 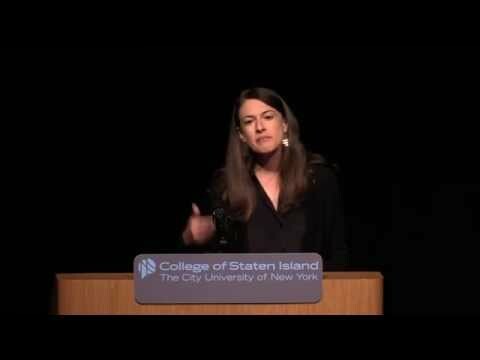 She uncovers the surprising roots of hot button issues, from teacher tenure to charter schools, and finds that recent popular ideas to improve schools—instituting merit pay, evaluating teachers by student test scores, ranking and firing veteran teachers, and recruiting “elite” graduates to teach—are all approaches that have been tried in the past without producing widespread change. And she also discovers an emerging effort that stands a real chance of transforming our schools for the better: drawing on the best practices of the three million public school teachers we already have in order to improve learning throughout our nation’s classrooms.